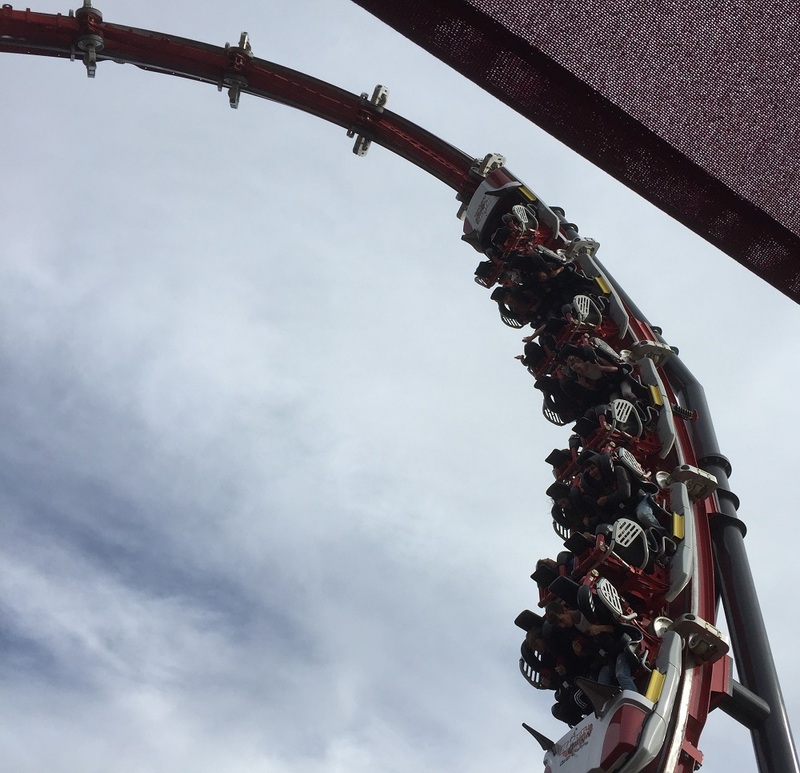 With a new ride recently opening, and a new coaster on its way in 2019, Six Flags Discovery Kingdom has grown rapidly these past few years. Greeting guests as they drive into the park’s main entrance is Discovery Kingdom’s newest ride: Harley Quinn Crazy Coaster. 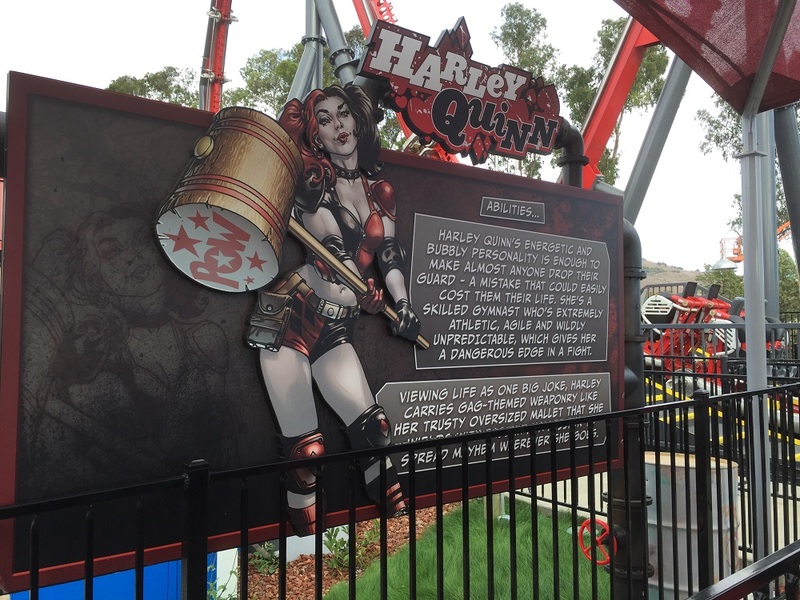 The first of its kind, Harley Quinn is manufactured by Skyline Attractions, known as a Skywarp. The ride pits two 16-person trains, with riders facing each other, as they travel through twin Immelmann inversions. Harley Quinn is similar to a Larson Super Loop, as the trains rock back and forth as they gain speed, oftentimes hanging riders upside down. But the ride’s figure-eight design and “fly-by” feature gives it a unique twist. Being a prototype, Harley Quinn has proved finicky in terms of reliability. The ride was originally scheduled to open in late May, yet was delayed a few times before quietly opening in late July. 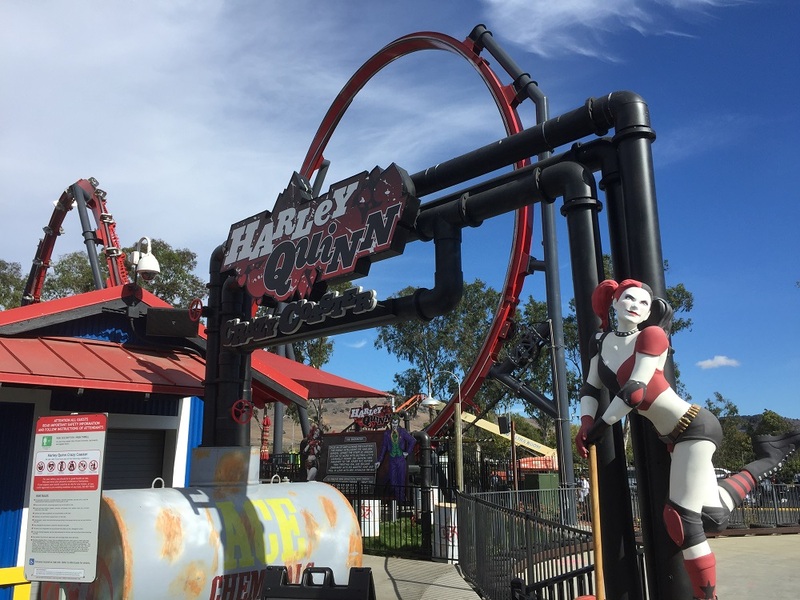 On a recent visit (Oct. 28), Harley Quinn opened in the late afternoon, with only one train being filled with riders. Sitting in the front row, it can be intimidating seeing the track curling over your head as you wait for the ride to dispatch. The ride experience itself is quite unique (if a little rough) as you quickly loop back and forth through the tight layout. Since I’m not a big fan of Larson Super Loops, I’m glad to see that Harley Quinn doesn’t have excessive amount of hangtime; it rocks back and forth fairly quickly as it gathers momentum without leaving you upside down for too long. It’s relatively short ride cycle is actually a plus, as I didn’t experience any dizziness from the constant flipping. I wish, though, that the fly-by feature was more effective. It seems almost too quick and unnoticeable, but perhaps that was because the other train was empty on this particular cycle. Harley Quinn is shoehorned next to Superman Ultimate Flight, across from the Joker. And as if that side of the park couldn’t get anymore loaded with top-notch attractions, Batman: The Ride will open next to Harley Quinn in 2019. 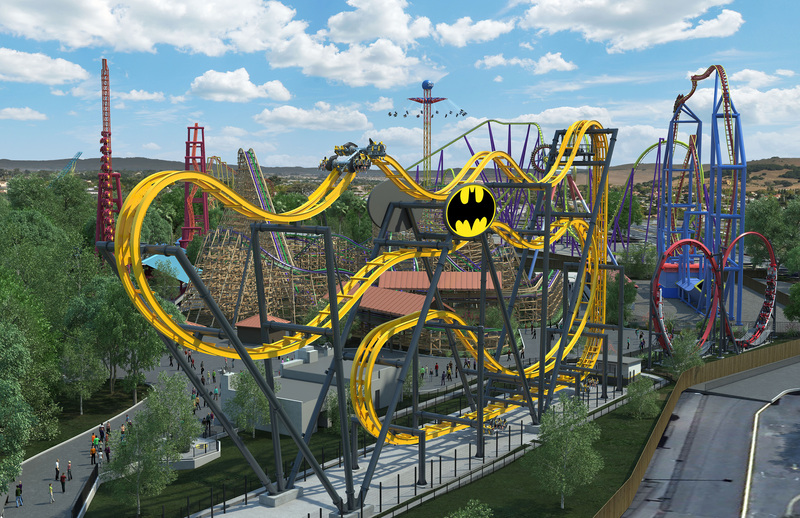 Billed as the first 4D coaster in Northern California, Batman will be manufactured by S&S, based on its popular Free Spin model. It will stand 120 feet tall and feature a 90-degree lift hill. 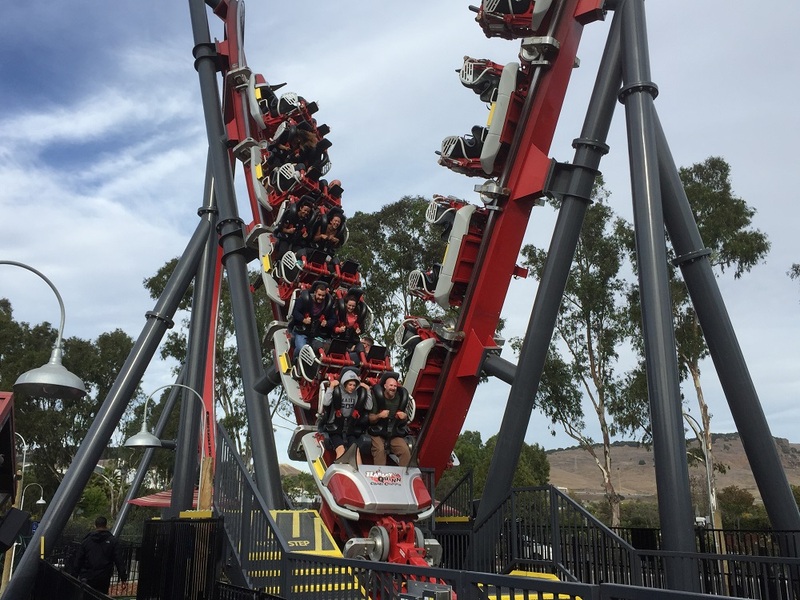 Depending on the weight of the riders, guests can expect to flip at least six times as the train traverses its twisting I-box track frame. 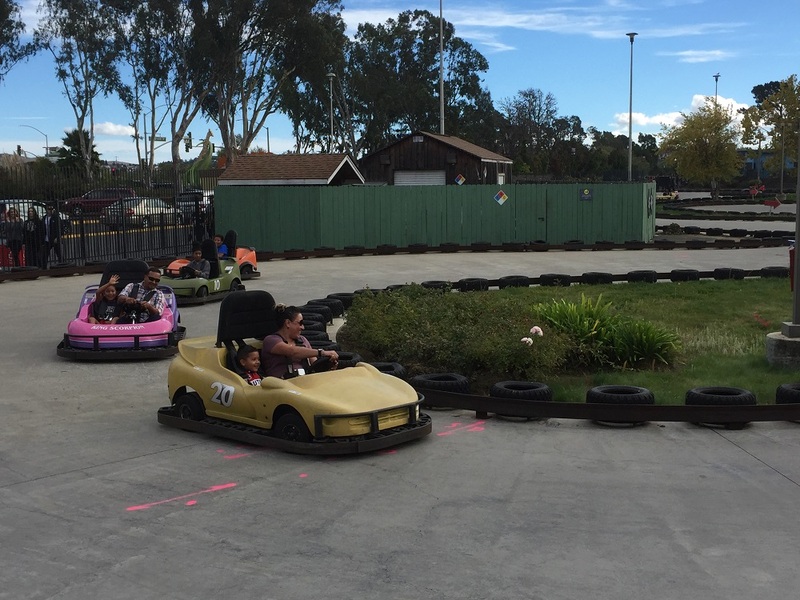 Batman will replace Thunder Road Speedway Go-Karts. With Fright Fest over for the season, Discovery Kingdom is now gearing up for Holiday in the Park. The event runs select days Nov. 23-Jan. 6. For a schedule, visit www.sixflags.com/discoverykingdom.